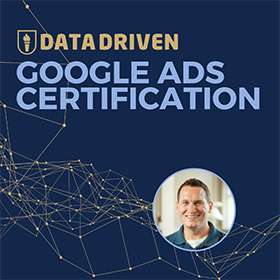 Let’s start with a little bit of background on my experience building online courses. Back to a time before I discovered LearnDash. I launched my first online course in 2014, using a landing page platform called OptimizePress and a membership plugin called MemberMouse. It was a disaster. Everything that could do wrong went wrong. Some of it was related to my technology choices, but to be honest? I had no idea what I was doing. It took me 14 months to develop my website, and during that time my courses made a grand total of $1,000. Things were not working out for me. But it was a great learning experience. I learned that too much technology can hurt you. It is not “passive income” if your website needs a lot of maintenance. My technology choices made me jump through many hoops just to keep the courses running, and I had no time to be proactive. It was a painful process that was not scalable at all. At one point, I decided to just delete the site, a site I spent 14 months creating, rather than maintaining the technical debt. It wasn’t working out, so I cut my losses and went elsewhere. Technical debt or a lack of experience? Simplify! When you are first getting started with developing online courses, choose the easiest technology. Otherwise, you will spend more time getting technology to work than you will teaching your craft. On my second attempt in 2015, I decided to try out a complete hosted online website platform called Rainmaker Digital. The setup was straightforward, and there were few settings to tweak or manage. Creating a course was really easy. All I needed to do is to upload the video, add text, and it was done! They handled account setup and user access. It wasn’t exactly meant for online courses, but I made it work. But over time, it stopped working for me as well. Almost the exact opposite problem from what I had with my first course. The problem wasn’t complex technology. The system was too simple for my growing needs. They weren’t upgrading their tool nearly as quickly as I was progressing my business, which started to hold me down in another way! It was a great tool for bringing in the first $50,000 in revenue, but it wasn’t going to get me to six-figures. It was time for me to find another solution. That meant that I needed to start from scratch again. I tried Teachable, Sensei and other platforms and membership softwares. I did a bunch of free trials of WordPress plugins; installations and subsequent un-installations. And then I fell in love with something called LearnDash. The rest of this post is dedicated to showing you why I love it so much. First, I love LearnDash because the developer is honest. It feels like a single person is developing the software, or at least he is the primary visionary behind LearnDash. There might be other developers involved as well, but Justin is the figurehead of the business. And he is working hard to make LearnDash the best learning management software out there. LearnDash focuses on building the perfect software for learning online. It may not have all the bells and whistles other platforms have, but the features are spot-on for what I need. What’s even better is that it’s built on top of WordPress. I like anything that’s built on WordPress, because I can customize the code if I need to, without causing a major security issue. Not only that, but it integrates with all the other plugins I use to run my websites. We currently have 3 courses running on LearnDash, each have made over 6-figures in revenue! By having stable technology in place, we have been able to focus more on revenue growth and product improvements. Here are 8 things we love about LearnDash. And 2 features that we can’t wait to explore in 2018. The course content is structured in an easy to understand hierarchy. At the highest level is the course, followed by lessons, then topics. There’s also quizzes, certificates and assignments that you can add to each of the levels. It’s basically all you need to build a course. 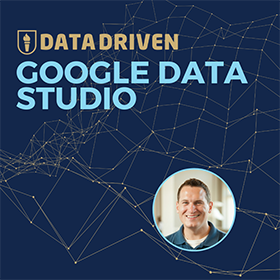 Let’s take Beginner Google Analytics for example. 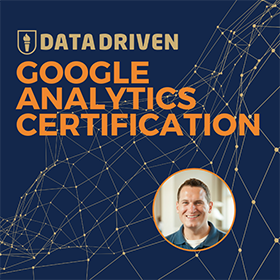 This Beginner course is part of the full Google Analytics Course. The Beginner lessons are set up as a course in LearnDash, and we have 10 lessons inside. We also have a quiz in this course, which comes after all of the lessons. 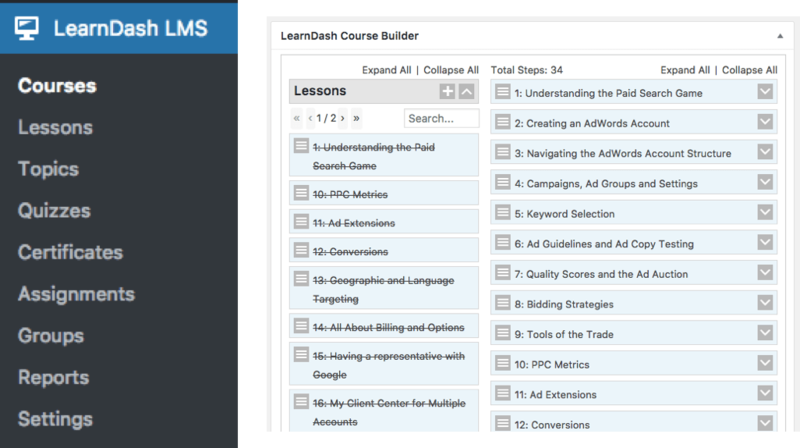 To organize all this, we use the handy drag-and-drop feature of the LearnDash Course Builder. Using is feature, we can control where things are showing up. The hierarchies are easily defined and the visual presentation makes it really easy to understand. You can set up access to the different courses (and their contents) based on what the student has purchased. The ability to lockdown content is the most important part of any online learning management system. 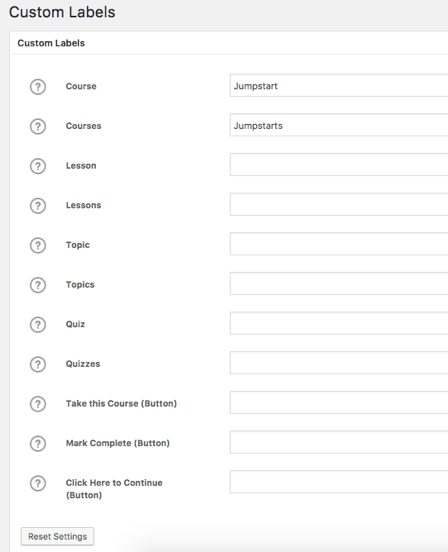 LearnDash provides a few options when defining access to the course content. You can set courses to be only available to paying students, and you can select the payment mode of either one-off or recurring subscription. You can also build courses that free to join. As the control is done at the course level, you don’t need to worry about parameters of individual content pieces (lessons, topics, etc.) within that course. This saves a lot of time! You can rename what we call courses or other custom labels in the system. This is not just for internal use, but is reflected on the students’ end. 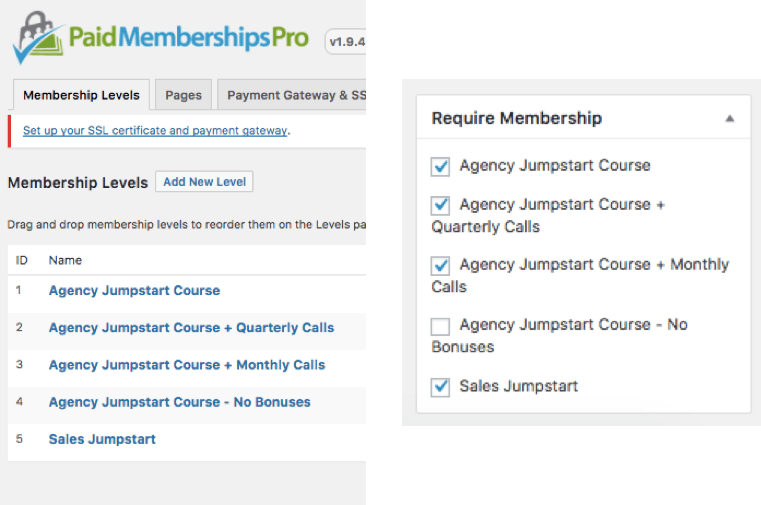 In our Agency Jumpstart Course, we renamed Courses into Jumpstarts. Why did we do that? Because in Agency Jumpstart, you’re not really taking a course, you jumpstarting your business. To be consistent, we don’t use the word course on the website (other than in the domain name). Having the ability to rename in one spot is very handy. Once it’s renamed, everything downstream is automatically fixed within the learning management system. LearnDash has built-in shortcodes which are specific to its system. You can use these ready made shortcodes to do nifty things. You can use shortcodes to show the student’s learning profile. You can also use shortcodes to identify whether a user is a student or visitor. This creates a dynamic experience for all students! Using shortcodes, you can display the right content, to the right people, at the right time. As there are different levels of access and different reasons why people might access your site, you can protect your course content with shortcodes. With LearnDash, you can drip feed the lesson content to your students, and not release everything at once. There are 2 ways you can drip feed content: relative to sign-up date and with fixed dates. When it is dependent on the sign-up date, the lesson will only be available to that specific student after X days of signing up. This is great for courses with rolling admission. As enrollment can happen anytime, each student will have a personalized experience. We use the fixed date setting when we’re launching a new course. This allows use to identify a cohort of students going through the lessons at the same time. This works well for most cases. When we did have an issue with drip feeding content for subscription-based packages, we worked with the LearnDash support and development team, and they solved the issue within 2 weeks. Another reason to love LearnDash – their support team is very helpful! It integrates with e-commerce softwares. We use the LearnDash – WooCommerce integration to sell courses. WooCommerce has all the bells and whistles you need in an e-commerce platform, right within WordPress. The integration is easy to configure and use. Within a WooCommerce product, you can select related course/s. After the successful purchase of the product, the student will be given instant access to the related lesson content. LearnDash integrates with membership software plugins too. The membership software we have in place is called Paid Memberships Pro. The integration will give you the flexibility of locking down specific pieces of content based on the membership level. It’s a straightforward process to decide who gets access and who doesn’t. This integration matches the complexity of our business as we’re growing and putting more products out there. We use the LearnDash integration with BB press to handle our course forums. The integration allows you to lock down access to forums based on the courses enrolled. Students can only see forums which are related to their courses. We also use this function to hide our forum content from search engine crawlers. LearnDash has pretty much everything we need at the moment. But there are features and functions we still haven’t had a chance to try out. This year, we have our eyes on integrating two more features. The first feature we’re excited about is the integration with Zapier. The zaps I have in mind aim to keep closer track of our students progress, and be able to facilitate their learning better from the data collected. For example, when a student completes a lesson or topic, we would update their profile. We could also send them emails based on how far along they are in completing the course. We also want to use Zapier to allow LearnDash to talk to our email marketing software, Drip. The other feature we would like to start experimenting with is learning badges. Learning badges is a form of gamification that I’ve always wanted to introduce to our courses. LearnDash integrates with a plugin called Badge OS. Badge OS assign points to actions like completing a lesson or acing a quiz. These are the plans I have for 2018 and I’m really looking forward to testing and implementing them. I wouldn’t say that LearnDash is the fanciest learning management tool available. It doesn’t have as many bells and whistles as other platforms, but that’s why we love it. All we need is a learning management system that helps our students learn and access to content we create for them. A system that helps students keep track of what they’ve learned. A system that is easy to use! 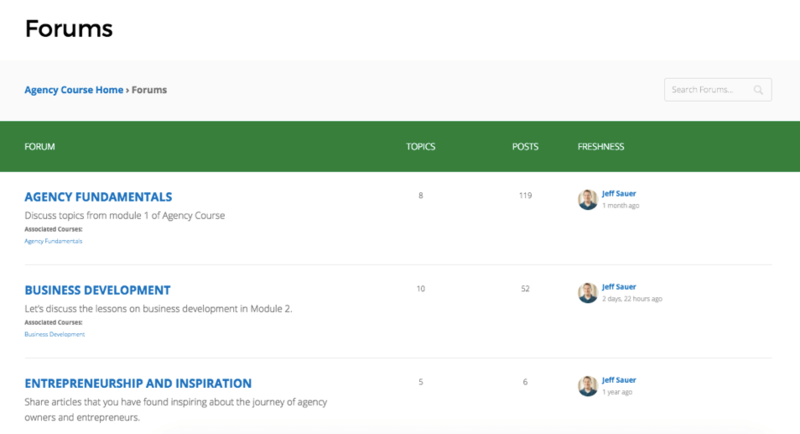 If you’re building an online course as well, and are looking for a learning management system to help you to deliver your content, then I highly recommend giving LearnDash a try. You can read and learn more about LearnDash here. This post and video was episode 42 in our 90 Day Challenge digital marketing series.